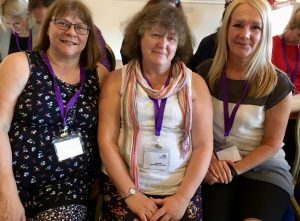 On 26th September the branch of the RCM in Southampton held a study day dedicated to considering human rights concerns in maternity care. It was attended by over 50 practitioners from across the region. Topics covered included a workshop by the human rights in maternity charity, Birthrights, and speakers from Barnados and Stop the Traffik. 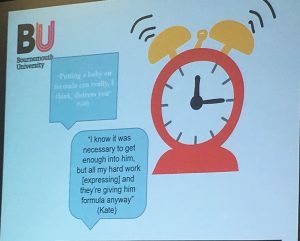 These latter presenters provided thought provoking, and somewhat harrowing, evidence for the need for awareness of sexual exploitation in young people, and trafficking of humans in our areas of practice. In addition Dr Jenny Hall (pictured right) from CEL and Jillian Ireland, visiting researcher in CMMPH, discussed the human rights of women with disability, based on current research partially funded by Birthrights, undertaken with colleagues Professor Vanora Hundley and Dr Bethan Collins from Liverpool University. 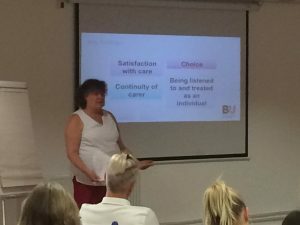 It was an intense event that demonstrated the importance of discussing and researching these aspects of current midwifery care. When the conversation took place the statistics showing the number of midwives required was 2600 (by the time the project had commenced it had risen to 3500). 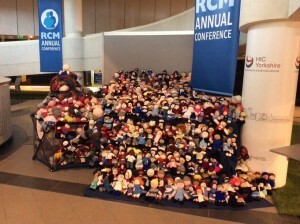 To highlight the situation, the @knittedmidwife was born, encouraging midwives and others to ‘knit a midwife’ to solve the problem in time for the RCM conference. Instructions for a simple pattern were placed on a blog and participants were encouraged to create their own clothes. 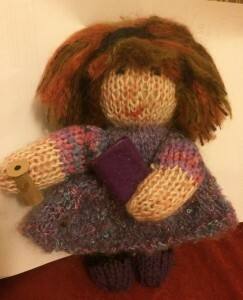 The campaign caused some amusement and inspiration with non-knitters persuading friends and family to knit one for them. Some midwife teams had ‘knit-evenings’. They arrived in batches from as far afield as Texas and Germany. The display at the conference was well received but the knowledge that the number presented was only 500 of the 3500 missing midwives gave impact. A final twist was that each was sold in aid of the RCM benevolent fund; midwives being sold to aid other midwives. As an adjunct to the project the ‘knitters’ were asked to send with their midwife a message as to why they had done so. At the conference itself questionnaires were also present to inquire about the impact of the display. This ‘knitted midwife’ project will therefore live on as the lecturers mentioned will now be evaluating the messages and questionnaires. And here is the mini-me midwfery lecturer, complete with pinards stethescope and tablet computer….. More will follow as the project develops. As part of my EdD thesis on ‘The essence of the art of a midwife..’ http://eprints.uwe.ac.uk/16560/ I created a reflexive textile quilt, with each of the squares representing an entry in my research diary. Whenever I have been to conferences with my quilt the question has always been asked ‘what do the squares mean’? Though I anticipate that anyone looking at it will gather their own interpretation of the squares my stories behind them are now accessible online. In the spring of this year I applied, and was pleased to receive, funding from the BU Undergraduate research assistantship scheme in order to create a web site for the quilt. For the past six weeks George Upson undergraduate student from the BA (Hons) Media Production course has been active in designing and creating the web site with me and learning about the world of academia in a small way. I am indebted to him for his creative abilities and to Garratt Lynch and Richard Wallis for their early support in the process, and also for the URA scheme! 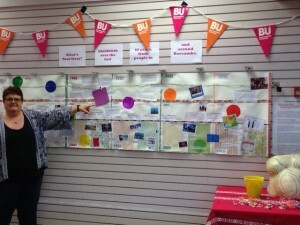 FoL event: What’s your story? Childbirth over the last 60 years. 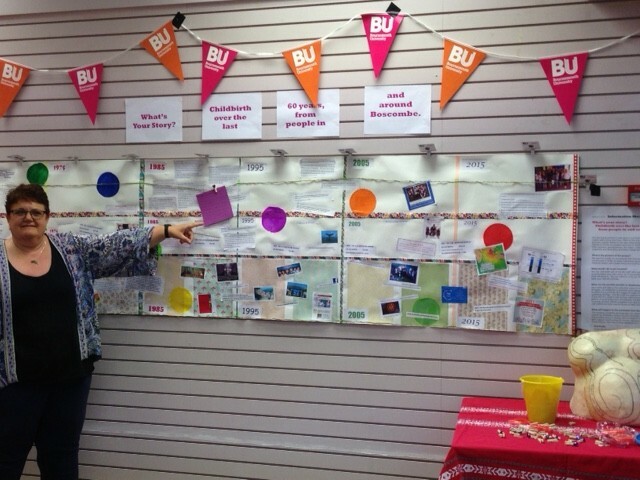 The day was spent encouraging members of the local community to contribute to a visual timeline of personal experiences of receiving or providing midwifery care, over the last sixty years. 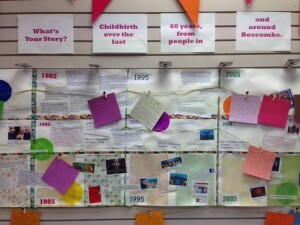 The aim had been to engage local people in order to interrogate the local history of birth in the area. However on the day we gathered a wealth of stories from mothers, partners, grandparents and children with tales from the 1960’s to the present day but with a very international flavour! We are very grateful to all those who sat and took the time to share their personal stories and were willing to add to the timeline. The stories were both moving and unexpected- that’s how research goes sometimes! More will develop on this project over time. 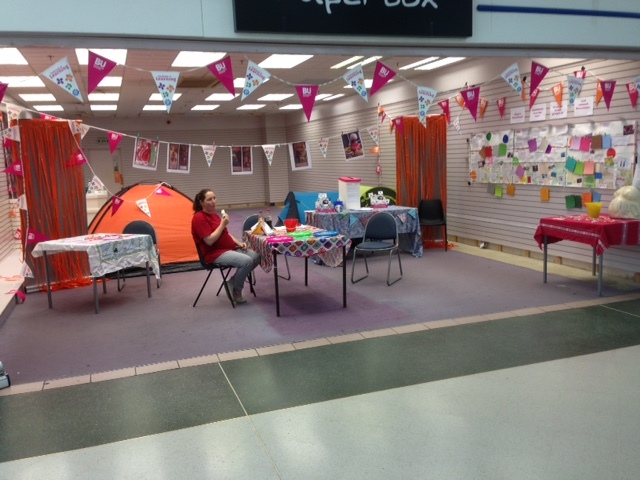 We are also grateful to the team at the Sovereign centre who were so accommodating. Dr Jenny Hall presented as part of a symposium with midwifery colleagues from Malta on an ongoing educational project relating to promotion of physiological birth in Malta. 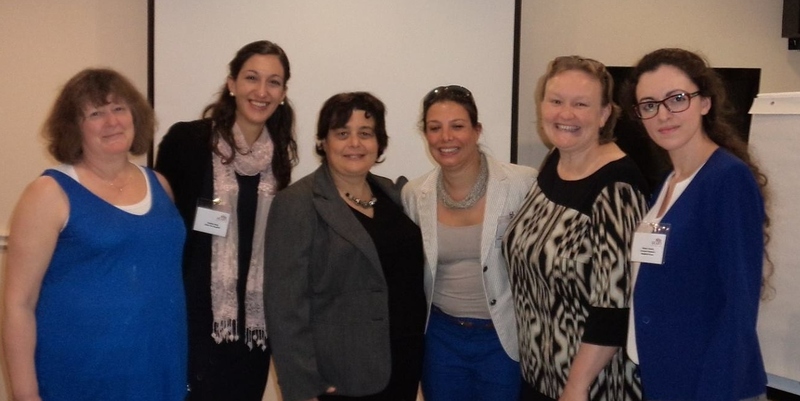 Malta has one of the highest Caesarean section rates in Europe and the team have been working together to develop midwives confidence in facilitating physiological birth as well as supporting them to educate women and families. As usual the conference provided extensive opportunity for networking and developing links for future collaboration in a considerably relaxing environment. Mary Seacole was a Jamaican and Scottish nurse and business woman who is honoured for her work during the Crimean war. The NHS awards in her name provide nurses with the opportunity to develop a project to benefit and improve the health of people within BME communities. On January 15th a day was held at the Royal College of Nursing in London for current and previous award holders to enable and encourage dissemination of their projects. 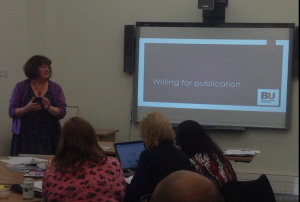 As part of this event Dr Jenny Hall, Senior Midwifery Lecturer in the Faculty of Health and Social Sciences, provided a discussion around the perspective of being an editor and tips around writing for publication. She also talked to some participants about current dissemination projects on which they are working and gave some support and advice. It was a positive event to help facilitate dissemination of valuable projects and to link with midwives who are current award holders. 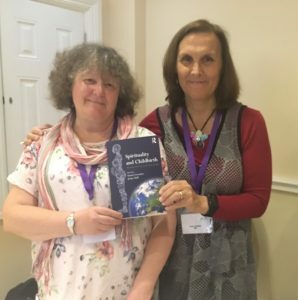 The festival was an eleven day series of lectures to share and celebrate research from the Faculty of Social science and Law and had sponsorship from the ESRC Festival of social science. The sponsorship meant that it was open to the public and therefore anyone could turn up. 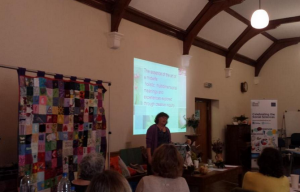 The day was called ‘Patchwork, quilting and keeping it all going’ and arranged by inspirational Management academic and quilt researcher Ann Rippin http://annjrippin.wordpress.com/ Ann placed in social and historical context the study of quilting and the history of quilters, identifying the lack of research around this significant social activity. 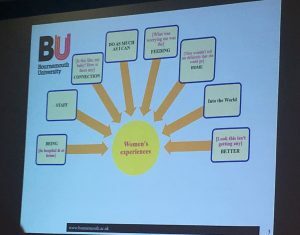 Harriett Shortt from the business school at UWE Bristol shared how she had developed a quilt as a response to her PhD studies. http://harrietshortt.wordpress.com/ Jenny also talked about the process of reflexivity in her EdD study around developing her quilt as well as the creation of ‘text quilts’. The audience included researchers as well as members of the public active in stitching. Overall it was a day that stimulated a lot of discussion around the use of creative craft in life as well as research and highlighted the need for more work around quilters to be carried out.